By now you are familiar with both forward budgeting and the digital system. There are different tools that can be used to track forward rolling digital finances as with the other systems. While it is completely feasible to use an envelope system for your budget, it may be a bit more complicated for this type of budgeting. You can use a printable, a digital envelope tracking system, or tangible envelopes. This system is a bit more difficult because your funds are electronic and because there are a lot of places to look at the end of the month to transfer money into the savings account. A check register would work great if you prefer not to use a computer based tool to track your finances. Each month, use your check register to track every transaction. At the end of the month, transfer all your additional funds to your savings account. A note to make on this is to keep a running balance on your account. For example, you can keep $1000 in your checking account each time. Thus, if you had $1700 in your checking account at the end of the month, you would transfer $700 to the savings account and $1000 would stay in the checking account. A buffer like this is a great way of preventing over-drafting your account at the beginning of the month. Computer spreadsheets are a great way for tracking your digital finances. A computer spreadsheet would work just like a check register. You would record each line on the date it occurred and then create an extra line for the transfer at the end of the month. 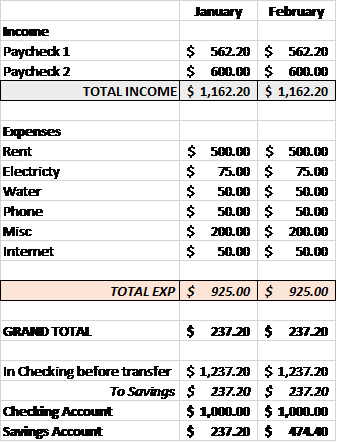 Additionally, you could create your spreadsheet to look like an income statement instead of check register. With this method, you can use each column for a new month so you can see multiple months at a time. You can also drag the formulas across the page to project for any period of time. Another way to track using the spreadsheet is to use one color for transactions that have not taken place and another for finalized amounts. For example: At the beginning of the month, have all the amounts blue. Once each transaction has been made, change the color to black. Originally you may have $75.00 blue in Electricity but after the expense occurs, it could say $73.24 (the exact amount) in black. This will help you keep track of which expenses have been paid. There are also many posts related to this type of a spreadsheet that can be found here. There are many apps and programs designed to track expenses. If you would like to track your finances digitally but are a bit overwhelmed by maintaining a spreadsheet, an app or program is a great choice. Apps have many great visuals and other features. 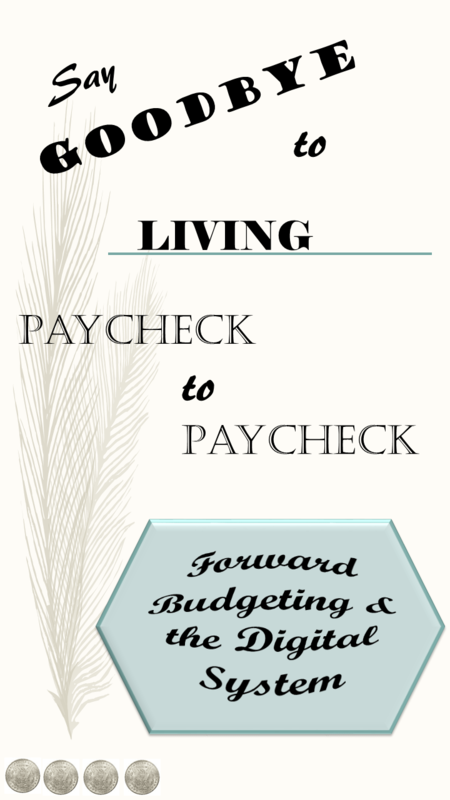 These are great tips and explanations for ways to budget. Thanks for sharing! I like your idea about moving money into your savings that way and keeping some as cushion. We’ve used a similar spreadsheet to track our budget, but changing the font color for paid bills is a great idea to add to it.